ASNA Visual RPG for .NET (AVR) comes with many project templates. The templates provided are generally serviceable, but wouldn’t it be handy to be able to create your own templates? This way each time you start a new project it’s got just the things you want, the basic forms you need, and all the extra goodies you usually use. And wouldn’t it be nice to make many of those to suit different your application challenges! 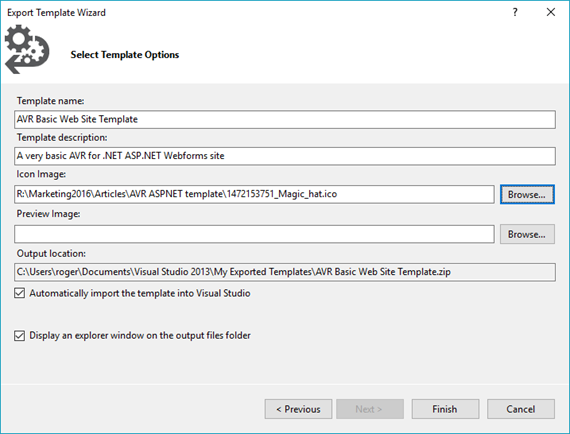 This article takes a look at how to create new Visual Studio project templates from existing projects. It’s very easy to do and really ramps up productivity starting new projects. Templates are easy to add, modify, and delete so there’s no risk involved. If a template isn’t working out, you can change or delete it and start over. The techniques shown in this article apply to both VS 2013 and VS 2015. This article describes creating new project templates–used to start new projects. You can also create item templates to provide templated project components (such as custom Web forms). Open this project in Visual Studio as if you were going to modify it or use it as the basis for a new app. Start template export by selecting File->Export Template from the top-level menu (as shown below). 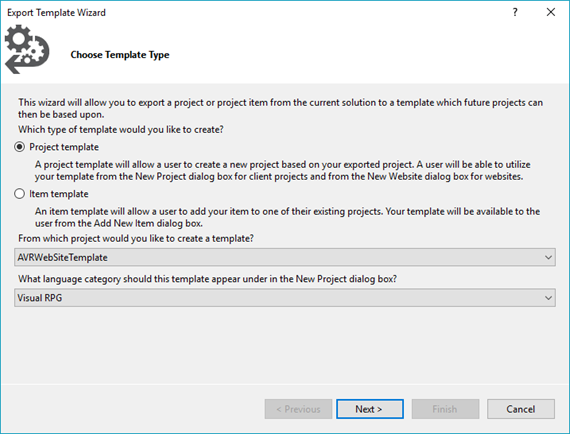 The “Choose Template Type” of the Export Template Wizard is displayed. 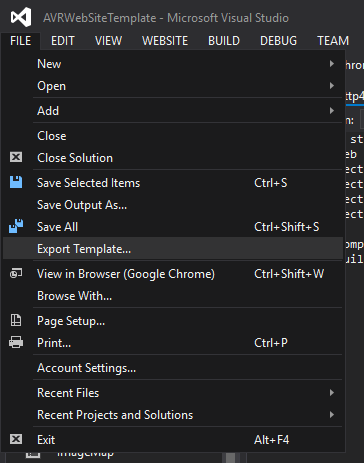 The “Select Template Options” page of the Export Template Wizard is displayed. Set the “Template name” and “Template description” to appropriate values. I usually find a 32x32 .ico file (there a zillion free-for-commercial-use .ico files on the Web) to use for the "Icon Image" and leave the "Preview Image" empty. If you don’t specify images here Visual Studio provides defaults. Microsoft specs for the images are terse, to say the least, but this blog post provides a little detail. Leave the two check boxes checked and click the “Finish” button. in the Windows Explorer listing. 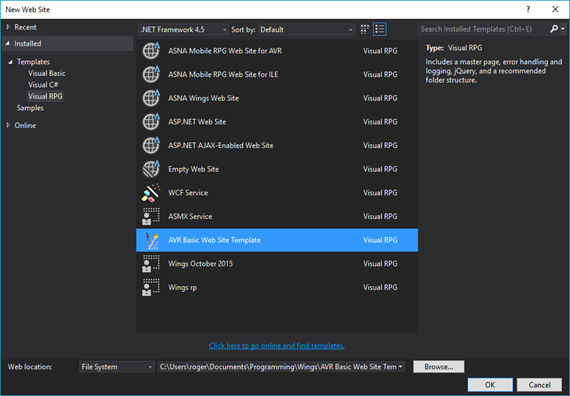 Visual Studio zipped up the project and put it here for you to use as a template. If you poke around on your system you’ll find instances of this file in a couple of folders that Visual Studio uses for caching. Close the project so that nothing is loaded in Visual Studio. Then use File->New->Web Site…” to start a new Web Site. When you select Visual RPG you’ll see the templates available and one of them should be your new template (in this example, it’s named AVR Basic Web Site Template). When you select that template you’ll get a new instance of the project used to create that template. This new instance is completely independent of the template. Any changes you make to a project based on a template are not reflected back in the template. Create a new project (with any name) based on the template you want to update. Make (and test!) changes to the new project. When you’re ready to update the template from this updated project, repeat the steps above using exactly the same template name you used when you created the template (as shown in Step 4). When you click “Finish” in Step 4, Visual Studio asks if you want to overwrite the existing template. Answer “Yes” to this dialog. The template has now been updated and the new version is ready to use. See this page for more information on updating templates. Unfortunately, Microsoft doesn’t provide a direct way to delete custom templates. Doing so requires a manual process that requires finding and deleting files on the disk associated with the template. This example shows how to delete a custom template named AVR Empty Web Site Template. folder, so start the search there. The resulting DOS screen, shown above, shows three template-related things to delete. At first glance, it looks like there are three zip files to delete. Look closely, the first entry isn’t a file, but rather it’s a folder. Note that the exact folder names displayed depend on what version of Visual Studio you’re using. Using either the DOS command line or Windows’ Explorer, delete that folder and the two zip files from your system. After doing that, the template will no longer be displayed in Visual Studio’s template list. If you left Visual Studio opened while deleting templates, be sure to exit and restart Visual Studio.